BlackRock’s Larry Fink and Steve Schwarzman of Blackstone have joined other CEOs in skipping Riyadh’s “Davos in the Desert”. Private sector boycotts usually follow state sanctions. The U.S. government’s inaction reflects its reliance on Saudi Arabia, and fear of high oil prices. 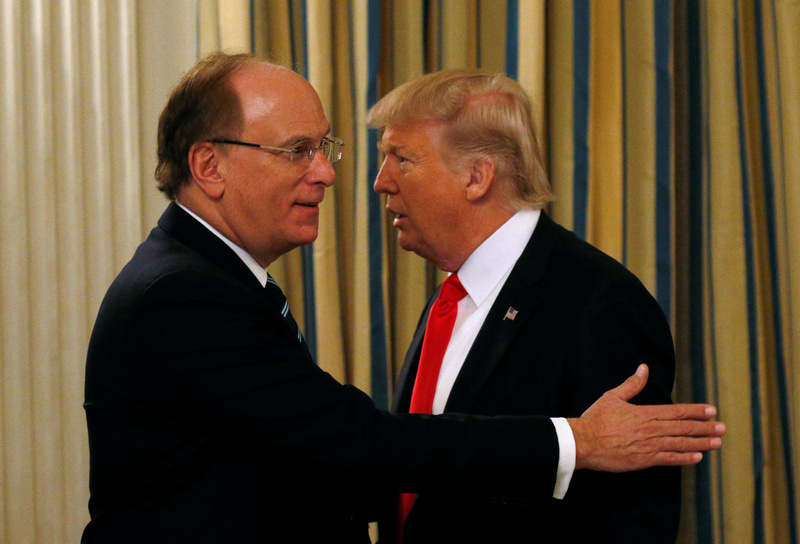 U.S. President Donald Trump talks with BlackRock CEO Larry Fink as he hosts a strategy and policy forum with chief executives of major U.S. companies at the White House in Washington February 3, 2017. Stephen Schwarzman, chairman and CEO of private equity firm Blackstone Group, and Larry Fink, chairman and CEO of fund management giant BlackRock, will not attend Saudi Arabia’s Future Investment Initiative on Oct. 23-25, according to people familiar with their plans. JPMorgan Chairman and CEO Jamie Dimon announced he would not attend on Oct. 14, joining other business and finance leaders in avoiding the event. Reuters reported on Oct. 12 that U.S. Treasury Secretary Steven Mnuchin was planning to attend. White House economic adviser Larry Kudlow, asked about the Trump administration 's continued participation on Oct. 14, suggested that Mnuchin may ultimately not go, depending on the results of the ongoing investigation. "It's a very important meeting but he... will want to see how things go in the Saudi investigation or the general investigation of the Khashoggi tragedy," Kudlow said on "Fox News Sunday". Bankers are beginning to doubt there is enough appetite among lenders to raise a $50 billion to $70 billion loan to back oil and gas giant Saudi Aramco's acquisition of a stake in chemicals group SABIC due to concerns over country lending limits and mixed messages from the ruling family about the kingdom's long-term funding plans, IFR reported on Oct. 12.